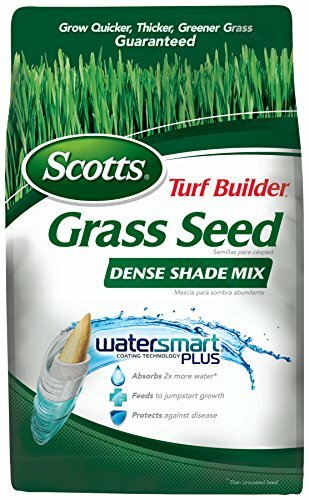 Scotts Turf Builder Grass Seed Dense Shade Mix is an exclusive mix of shade tolerant and self-repairing grasses. This mix is ideal for seeding around or under areas of dense trees, and it grows with as little as 3 hours of sunlight. Each seed is wrapped in a unique WaterSmart PLUS Coating that absorbs 2x more water than uncoated seed, feeds with essential nutrients, and protects seedlings from disease. Grow Quicker, Thicker, Greener Grass. Guaranteed. If you have any questions about this product by Scotts, contact us by completing and submitting the form below. If you are looking for a specif part number, please include it with your message.